After attending Cheltenham Ladies’ College, she graduated from Girton College, Cambridge with an MA, and obtained an MSc in Economics from the London School of Economics. Her earlier career was spent at HM Treasury, which she joined in 1968 and where she worked on a wide range of macro economic, monetary, and financial issues. 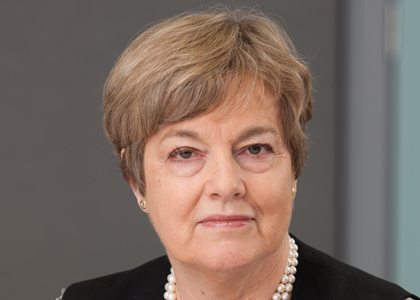 She was Principal Private Secretary to the Chancellor of the Exchequer in the mid 1980s, and Deputy Chief Economic Adviser in the early 1990s gaining responsibility for financial regulation and city affairs in 1992. She is a non executive director of The Scottish American Investment Company and is on the Board of the Royal National Theatre and of De Montfort University. Rachel Lomax has 40 years financial experience, much of it gained at the heart of the British economy. Rachel’s insight into monetary policy provides an incisive and enlightening view of the world we live in today. Rachel served as Deputy Governor of the Bank of England and as a member of the UK Monetary Policy Committee for five years between 2003-2008. Rachel’s early career was spent at HM Treasury and her extensive experience of international financial policy making at the highest levels makes her a heavy weight commentator on economic matters today. Rachel draws on her extensive experience to speak on macroeconomics, the financial markets, monetary policy, public-private sector issues and global institutional reform. Before joining the Bank of England, Rachel was Permanent Secretary of three UK Government departments preceded by a period as a Vice President and Chief of Staff to the President of the World Bank from 1995-96. At the UK Government’s Treasury department, Rachel gained wide-ranging experience in macroeconomic, monetary and financial issues. She was Principal Private Secretary to the Chancellor of the Exchequer (finance minister) Nigel Lawson and then Head of the Economic and Domestic Secretariat at the Cabinet Office for the UK Government. Rachel is a non-executive director of several organisations including HSBC and BAA as well as President of the Institute of Fiscal Studies.